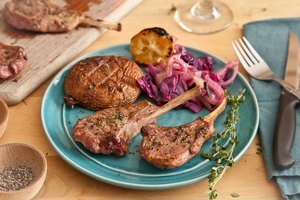 Lamb chops are similar in size to miniature T-bone steaks; they may look small, but they are packed with flavor. Cooking lamb chops is not a complicated process. These chops are served medium but can also be served rare or well done. They don't require trimming and can be cooked frozen, unlike other meats. The thicker the lamb chop, the more time it needs to cook. 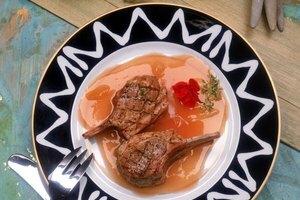 While the cost may be higher for lamb chops in comparison to other cuts of meat, they are worth every penny. You have a couple of ideal options when it comes to cooking the lamb: pan frying or grilling. Add water to a frying pan. Turn the stove onto medium; the pan is hot enough when the water begins to evaporate. Add 2 tbsp. olive oil to the pan and wait one minute for the oil to heat. Season both sides of the lamb chops with a pinch of salt and pepper. Place into the frying pan. Let the meat sear for four to five minutes., six to seven minutes if the chops are frozen. Flip the chops over, the opposite side should be brown. Sear the other side for another four to five minutes. Cooking the chops this long will make them medium. Add two minutes for well done or subtract one minute for rare and serve with your favorite sauce. Arrange the charcoal in grill to form a pyramid. Cover charcoal with lighter fluid, let soak for one minute. Light the charcoal. If using a gas grill, set to a high heat. Leave the grill closed for 10 to 15 minutes to heat the racks. Spread the charcoal out evenly when it begins to grey. Season each side of the lamb chops with a pinch of salt and pepper. Place the lamb chops on the grill. Cook chops on one side for five minutes. Leave on for two minutes longer if frozen. Flip chops over, cook for an additional five minutes. Same deal as with pan frying: grilling for this long will cook it medium, add two minutes for a well done chop or subtract two for a rare chop. Remove from grill and serve. 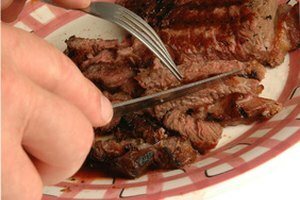 Check out these other grill-friendly recipes. 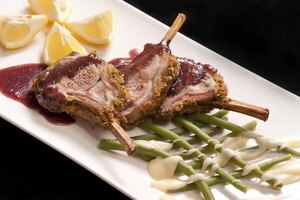 Lamb chops are meant to be served medium with the internal temperature being 150 degrees Fahrenheit, according to the Saskatchewan Sheep Development Board. An alternative to mint jelly is a yogurt sauce. Dice about five mint leaves and combine it with two parts yogurt and one part Dijon mustard. 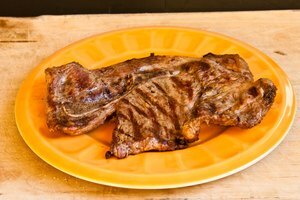 The Housing Forum: How to Cook Lamb Chops?